Form HTC-60 or the "Homeowners' Property Tax Credit Application" is a form issued by the Maryland Department of Assessments and Taxation. 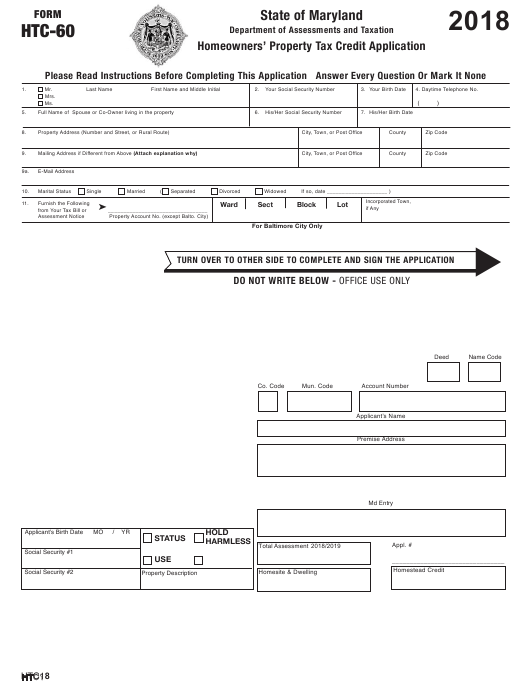 A PDF of the latest Form HTC-60 can be downloaded below or found on the Maryland Department of Assessments and Taxation Forms and Publications website. wish to be considered for a tax credit. for a credit and are urged to file this application. Department of Assessments and Taxation. tax will be used to determine your eligibility. you just recently purchased your home. 2. You must have legal interest in the property. certain trusts have sufficient legal interest. exceed $200,000 as of December 31, 2017.
hold income for calendar year 2017.
calculating those taxes eligible for credit. dwelling and does not include excess acreage. are not taxes eligible for credit. charges such as rent or room and board. your property tax bill or assessment notice. who purchased their home after July 1st, 2018.
by certified mail to have proof of a timely filing. in the home. If none, write NONE and not N/A. reduce the amount of gross income reported. others must be reported as income. gross income along with that of the applicant. deposit into another tax deferred account. basic legal requirements for filing have been met. the processing of your application. benefits received by the applicant. county or municipality in their official capacity and to taxing officials of any other state, or the federal government, as provided by statute. 12a. Do you own any other dwelling or other real estate in the State of Maryland or elsewhere? If yes, please attach to this application a separate list of where the properties are located, their property account numbers and their use. 12 b. Do you own or operate a business? 13. Will you reside in the property on which you are applying for the tax credit on July 1, 2018 and for more than 6 months thereafter? any nondependent filing an income tax return from this address. then list the total gross incomes of such residents in item 18, Column 3 (All Others). were received, then you must enter zero (0) in the appropriate space. 19. Did or will you, and/or your spouse, file a Federal Income Tax Return for 2017? separately, a copy of your spouse’s return) with all accompanying schedules must be submitted with this application. date additional information to verify the statements reported on this form, and that independent verifications of the information reported may be made. and all information concerning the income or benefits received.